Scientists from the Department of Astronomy at Harvard University have developed a new interactive website that models the interiors of exoplanets. An interactive tool to characterize and illustrate the interior structure of exoplanets is now available at http://www.astrozeng.com/Exoplanet Models.html This tool is useful for observers to quickly constrain the interior structure of an exoplanet, for modelers to use in their computer simulations, and for teachers to illustrate the diversity of planetary structures to students. In order to run this tool in a web browser, the user needs to download and install the free Wolfram CDF player. 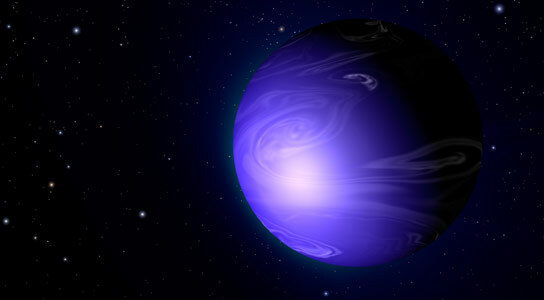 Current observations often measure the mass and radius of an exoplanet. However, those two numbers cannot tell you everything about a planetary interior. To constrain the planet’s structure you need a third number – the central pressure (p0). This interactive tool applies new Equations of States and assumes a fully differentiated planet interior made of three layers: an iron core, a rocky silicate layer, and a water/ice layer. It takes the mass and radius as inputs and first outputs the possible range of central pressure. Then the user may pick a particular p0 within the possible range as the third constraint, to uniquely define the corresponding planet structure and calculate its interior density profile, interior pressure profile, as well as the mass fractions and radius fractions of each layer. The lower bound and upper bound of the p0 range each corresponds to a two-layer model, while any p0 in between corresponds to a full three-layer model. The central pressure can be animated to increase in increments, to show how the structure changes continuously with increasing p0. This tool has been developed by Li Zeng and Dimitar Sasselov at the Department of Astronomy, Harvard University. Stay tuned as it will be constantly updated. 1 Comment on "Harvard Scientists Develop Interactive Website to Model Exoplanet Interiors"
We observed the Galactic supernova remnant (SNR) CTB 109 (G109.1-1.0) with XMM-Newton and Chandra. CTB 109 with its semi-circular shape is one of the most exotic objects in the X-ray sky. As neither X-ray nor radio emission is observed from the western part of the SNR shell, the SNR blast wave has apparently been stopped by a giant molecular cloud (GMC) complex located in the west. The EPIC data show remarkably little spectral variation across the remnant given the large intensity variations. There is an extended X-ray bright interior region known as the Lobe. This feature has previously been suggested as emission associated with the anomalous X-ray pulsar 1E 2259 586. However, the EPIC spectra show no indication of non-thermal emission. The Lobe is more likely enhanced emission from the interaction of the remnant with the GMC. The deep ACIS-I image reveals filamentary structures in the Lobe. Spatially resolved spectral analysis of the diffuse emission indicates variations in foreground absorption and plasma parameters in and around the Lobe.